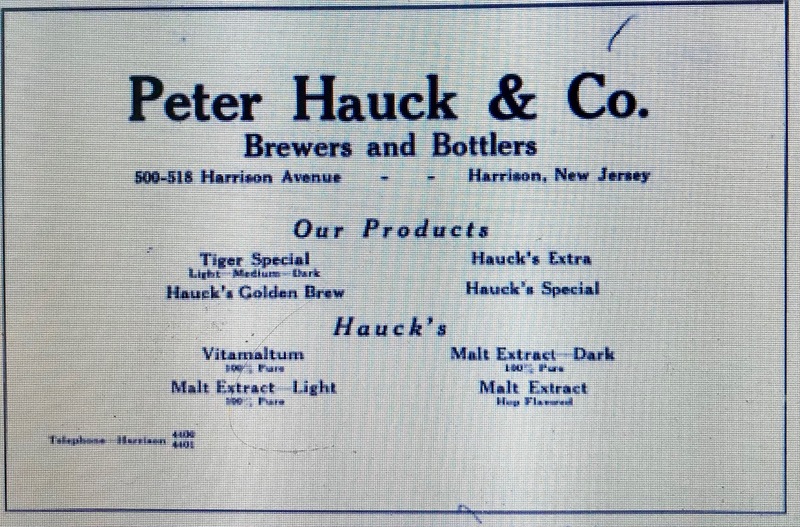 Peter Hauck & Co. operated the Peter Hauck Brewery, located in Harrison, New Jersey (also called East Newark) from approximately 1869 until the mid 1920’s. It’s long time proprietor, Peter Hauck, was a German immigrant who learned the business working in and ultimately taking over his father’s New York City brewery. His early background was provided in a biographical sketch included in the “Genealogical History of Hudson & Bergen Counties, New Jersey,” published in 1900. Born in King Munster, Bavaria, Germany, June 9, 1838, he came to this country with his parents when six years old, and located in New York City, where his father engaged in the brewing industry. There he received a good public school education. After completing his studies he entered his father’s establishment and thoroughly mastered the profession of brewer, acquiring a practical as well as a theoretical experience in every department of the business. The brewery established by his father, Adam Hauck, in 1844 on Wooster Street, New York, was a small affair, but the plant was enlarged until it became one of the largest of the kind in the city. In 1869 he removed the entire business to Harrison, Hudson County, N.J., where a substantial building was erected, and where it was continued under the most favorable auspices. The 1849/1850 NYC Directory listed Peter’s father, Adam, at 481 Broome Street with the business occupation “porterhouse.” Located at the intersection of Broome and Wooster Streets, this is likely the brewery referenced in the biographical sketch above . The business must have moved as it grew bigger. Two years later, the 1851/1852 NYC Directory listed the brewery at 89 Sheriff Street; still in Manhattan, but further east. It was still listed at this location in the 1864/1865 Directory. In the 1867/1868 Directory, Peter, not Adam, was listed at the 89 Sheriff address with the occupation “beer.” This leads me to believe that Peter was actually running the business prior to its move to New Jersey in 1869. In New Jersey the brewery was located on Harrison Avenue (sometimes Pike’s Rd) between 5th and 6th Streets. Initially it was run as a partnership between Peter Hauck and Frederick Kaufmann called Kaufmann & Hauck. It was listed this way in the Newark directories until 1875 when the partnership apparently filed for bankruptcy. A notice announcing the partnership as bankrupt and requesting that Hauck be discharged from his debts was printed in the August 21, 1875 edition of the New York Times. Over the next three years, Petr Hauck continued to be listed individually on Harrison Avenue but the business was not listed in either the general directory or the business directory so its not clear whether the brewery was operational during this period or not. The brewery was listed again in the 1878 Newark BusinessDirectory but one year later, on January 13, 1879, it was destroyed by fire. The fire was covered in a story printed in the Boston Globe. 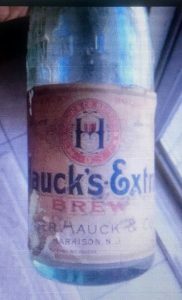 At 1 o’clock this morningPeter Hauck’s Hudson County lager beer brewery, located on Harrison Avenue, East Newark, was found to be on fire. The alarm was sounded, but the firemen, unable to obtain water, could not do anything to save the building, and the brewery was completely destroyed.The loss is as follows: Machinery, $50,000; building and stock, $35,000; and $15,000 worth of malt. According to the Genealogical History of Hudson & Bergen Counties Hauch rebuilt the brewery after the fire. In 1879 the brewery was destroyed by fire, but he at once turned his attention to rebuilding, and in 1880 erected and completed a new plant upon a more extended scale, making it a model establishment of its kind. It appears that the brewery remained operational during construction of the new plant. The Newark directories in the early 1880’s listed two separate brewery sites; the original Harrison Avenue location as well as another location at 281 to 291 Eighth Avenue which I assume served as a temporary brewery during the rebuilding process. By 1884, the Eighth Avenue location was no longer listed. The Genealogical History of Hudson & Bergen Counties went on to describe the newly constructed brewery complex. It has a frontage on Harrison Avenue, between Fifth and Washington Streets, of 225 feet, with a depth on Cleveland Avenue of about 100 feet. The main building is a substantial structure, and there is additional accommodation for the malt house, cooperage, bottling plant, etc., the whole being equipped with modern improvements, including a 250 barrel brew kettle, ice machines, cellarage, an artesian well, etc. The name “Peter Hauch & Co.,” was first utilized in the 1885 Newark Directory. Then, four years later, Peter Hauck & Co. was one of five breweries that were consolidated under a new corporation called “The United States Brewing Company.” A story in the May 14, 1889 edition of the Buffalo (NY) Commercial provided some details on the consolidation. Peter Hauck managed the business until he passed away on February 21, 1917 after which it continued under the management of his son Peter Hauch, Jr. It was listed in the Newark directories as Peter Hauck & Co. through 1922. In the early years of Prohibition it appears that the business was making a concerted effort to produce cereal beverages in accordance with the law. 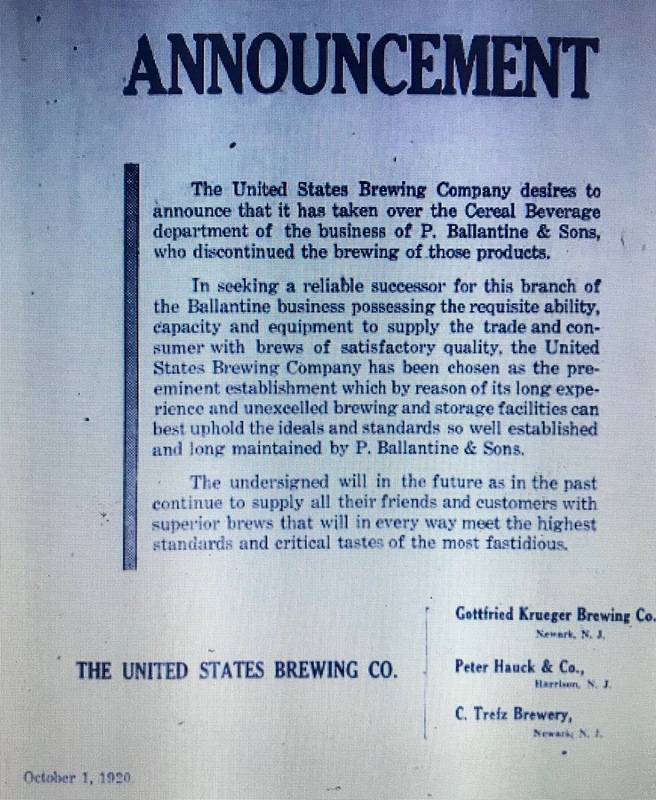 On October 14, 1920, notices appeared in many newspapers announcing that the United States Brewing Company had acquired the cereal beverage department of P. Ballantine & Sons, with Peter Hauck & Co., named as one of the brewers. This notice, printed in the October 4, 1920 edition of the Brooklyn Daily Eagle was typical. 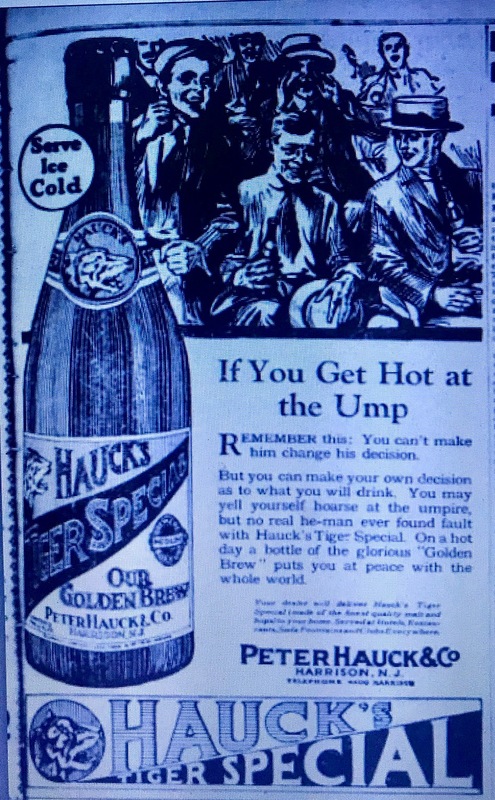 As late as 1922, the company advertisement in the Newark Directory listed a number of cereal beverages manufactured by Hauck including Hauck’s Tiger Special – Light, Medium and Dark, Hauck’s Golden Brew, Hauck’s Extra, Hauck’s Special, Hauck’s Vitamaltum and Hauck’s Malt Extract, Malt Extract-Light and Malt Extract-Dark. After Peter Hauck, Jr.’s death in September, 1922 the actual management of the brewery is unclear, however, this May 22, 1925 story in the Keyport (N.J.) Weekly made it clear that the brewery continued to operate, albeit illegally. Newark- Four officials of the Peter Hauch Brewery in Harrison were fined $2,500 each on charges of possessing and manufacturing beer of illegal alcoholic content by Federal Judge Runyon. All pleaded guilty, three changing previous pleas of not guilty. The officials are Isadore Rappaport, Morris Egel, Nathan Levy and William Hobby. The case resulted from a raid on the brewery several months ago by federal agents. DOWN THE SEWER yesterday went contents of 56,000 barrels of beer seized in Peter Hauck Brewery Company, Harrison, N. J. Agent C. H. Parkes manned the hose. Ultimately the brewery officially changed hands on October 16, 1925. The announcement of the sale was printed in the Asbury Park (N.J.) Press. Purchase of the Peter Hauck Brewery by the Harrison Holding Company of Merchantville was announced today. The price was not divulged, but the holding company gave a mortgage of $171,250 to be paid in monthly installments of $1,000. Subsequently, on January 1, 1926, the Harrison Beverage Company was incorporated to run the business of producing cereal beverages. The article of incorporation was printed in the January 1, 1926 edition of the Camden (N.J.) Courier Post. 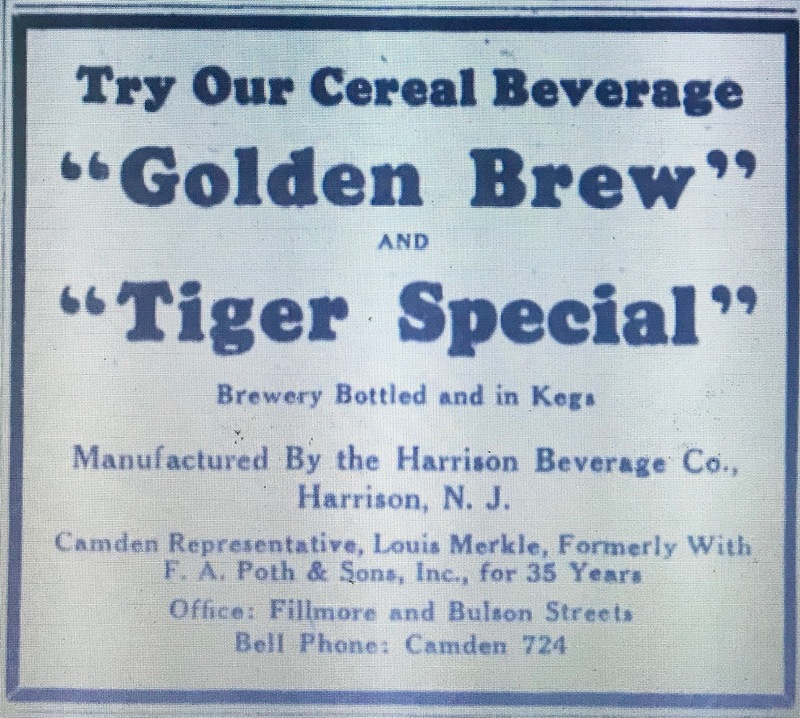 The 1926 Newark Directory listing for the Harrison Beverage Co., Inc. included the brewery’s Harrison Avenue address and included the phrase “successors to Peter Hauck & Co., brewers and bottlers Golden Brew and Tiger Special.” Advertisements for their cereal beverages ran in the local newspapers in early 1927. Prohibition agents however believed that the brewery was actually being run by racketeers and that cereal beverages were just a front for the manufacture and sale of the real thing. A story in the October 30, 1926 issue of the (Camden N.J.) Evening Courier that reported on a raid of the brewery provided the government’s point of view. As the Prohibition years continued, the brewery was raided several more times and the company was constantly in and out of the courts involved in Volstead Act related litigation. 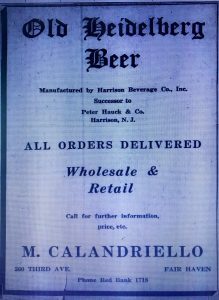 Ultimately in 1933, with Prohibition ending, the Harrison Beverage Company received a permit to brew 3.2 beer. 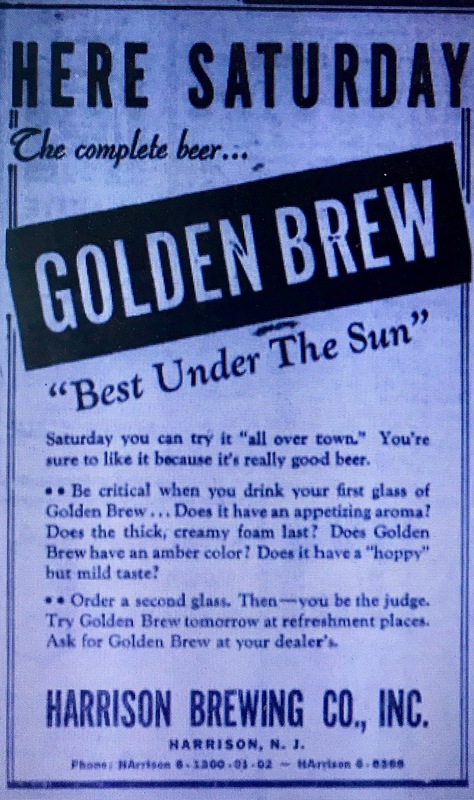 Soon after, they were advertising at least two brands; “Old Heidelberg” and “Golden Brew.” This advertisement for “Old Heidelberg” appeared in the The Long Branch (N.J.) Record on April 8, 1933. Their brewing permit however would quickly be revoked later that same year. The murder of two racketeers, Max Hassel and Max Greenberg in an Elizabeth New Jersey hotel triggered an investigation into the real ownership of the company, the government contending that Hassel and Greenberg, along with Waxey Gordon, another former bootlegger, were the real owners. As a result of the investigation their permit to brew was revoked on June 30, 1933. Camden N.J.’s “Courier Post” covered the story. The Harrison Beverage Company, of Harrison, yesterday had its 3.2 beer manufacturing permit revoked. And Dr. Hunsberger promptly ordered the permit revoked. As far as I can tell, after their license was revoked, the brewery continued to operate until sometime in August of 1933. At that point it was shuttered for good and put in the hands of a receiver. 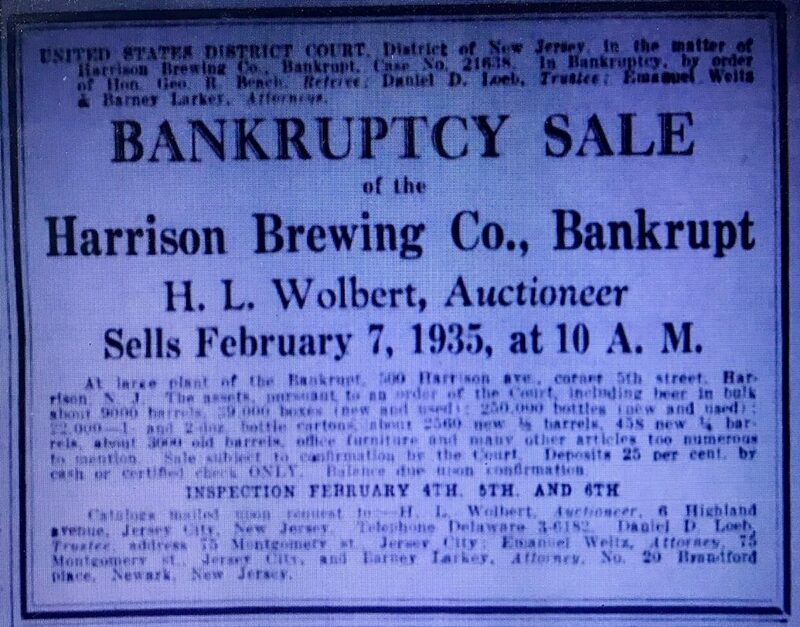 Six months later, the February 3, 1934 edition of the (Hackensack N.J.) Record announced the sale of the brewery at public auction. Harry C. Harper, Hackensack’s man of many moods and myriad enterprises, was one of the more than 100 bidders who journeyed to Harrison yesterday for the receivers sale on the old Peter Hauck Brewery, more lately known as a Waxey Gordon brewery. But it was a woman, Mrs. Lillian Bennett, said to be the daughter of a Columbus, Ohio, brewer named Tenion and said to live in a New York City hotel, who surprised the bidders, the crowd and the receiver by bidding $45,000 for the entire plant and equipment. 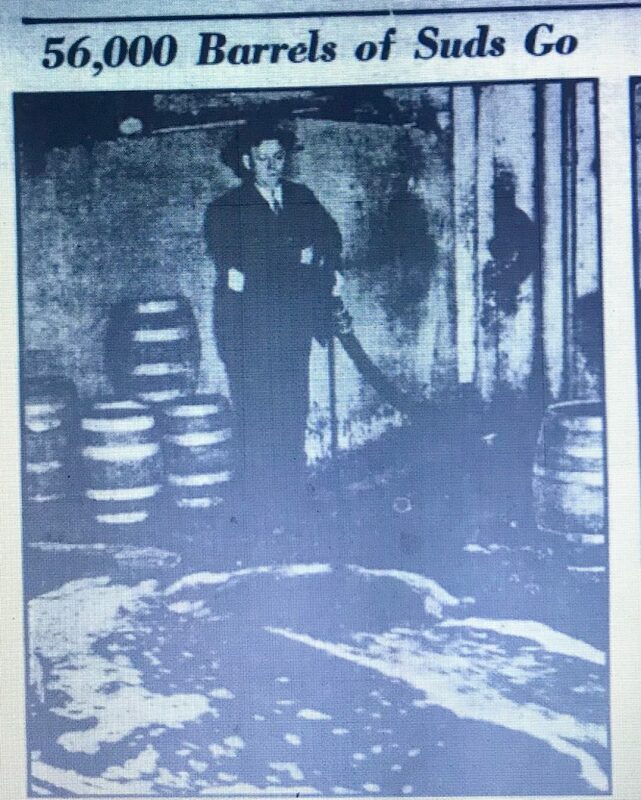 Among other things included in the mysterious Mrs. Bennett’s bid were 4,000,000 empty bottles and 14,000 barrels of 3.2 beer. After the sale, it appears that the brewery was leased to a newly formed corporation called the Harrison Brewing Company. The formation of the new company was announced in a May 20, 1934 story printed in the Central New Jersey Home News. Articles of incorporation of a new firm, the Harrison Brewing Company, were filed today by Harold Simandl, in an attempt to reopen the plant of the Harrison Beverage Company, closed by the Federal Government. The old plant was closed after charges during the 3.2 beer days, that the brewery was racketeer controlled. Simandl was counsel for the old firm. The incorporators are listed as Lucile Andreach, Selma Gerbinsky, and Frances Noviteh. The resurrection must have failed because less than half a year later, the company was bankrupt. A notice announcing the sale of the company assets, including barrels, boxes and bottles was printed in the January 30, 1935 edition of the Philadelphia Inquirer. 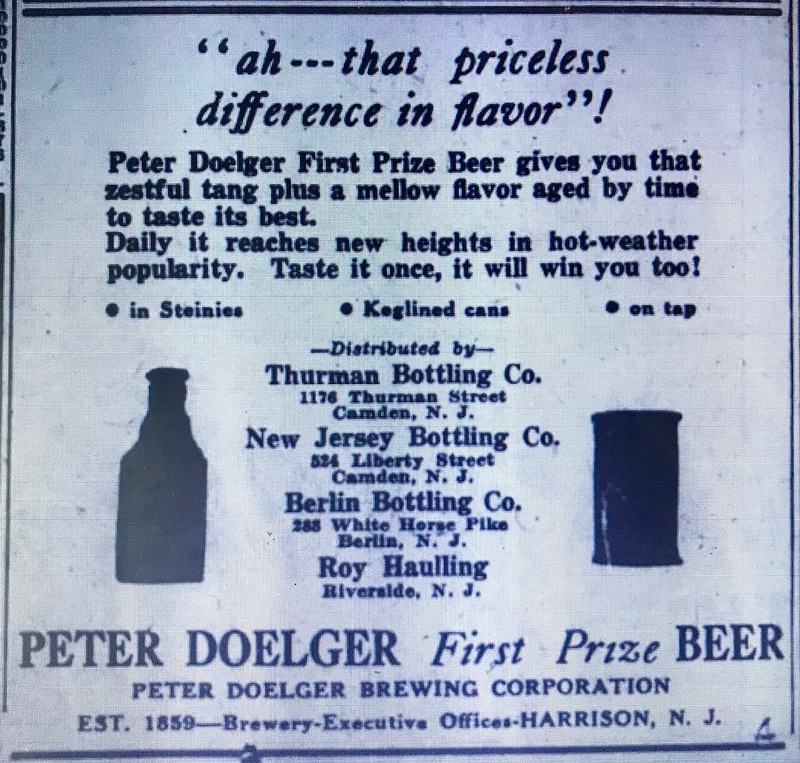 By 1937 the Peter Doelger Brewing Corporation had leased the brewery and was listing both their brewery and executive offices in Harrison, New Jersey. Peter Doelger remained there until 1948 at which time, according to this April 13 item in the (Bridgewater (N.J.) Courier, the company was declared bankrupt. Federal Judge Thomas F. Meaney yesterday declared the Peter Doelger Brewing Corp. of Harrison bankrupt and ordered it liquidated. After the demise of Doelger, the brewery was taken over by the Camden County Beverage Company. From the wording in this July 13, 1949 story in the (Camden N.J.) Evening Courier it’s not clear whether they purchased or leased the plant. The Camden County Beverage Co., brewers of Camden Beer at the Camden Brewery, announced yesterday it had acquired the Harrison brewery and will operate it as Plant No.2. Fred A. Martin, president of the beverage firm, stated a North Jersey outlet was necessitated by increased demand for the Camden product in Manhattan, Brooklyn and the surrounding metropolitan area in North Jersey. Leasing of the Harrison brewery will permit the Camden plant to use its entire output for its clients in South Jersey, Washington, several southern states and to reenter the Pennsylvania market. Three years later, in July, 1952, a fire swept through the Harrison plant. The resultant damage described in this July 16, 1952 story leads me to believe that this could very well have marked the end of the brewery facilities. Harrison, July 16 – A rampaging fire wrecked the Camden Brewery near the heart of the city’s business district today, sending up sheets of flame and clouds of smoke that were visible fo 15 miles around. The general alarm blaze raged out of control for more than two hours, but no one was reported injured. Fire officials said they didn’t immediately know the cause of the fire. The blaze started on the upper floors of the building which occupies almost an entire block. Flames ate their way down to the lower portion of the structure and firemen battled to prevent any further spread. Camden County Beverage continued to operate into the early 1960’s but I don’t see any mention of a Harrison location after the fire. Today the brewery site is home to the Washington Middle School. The bottle I found is 13 oz and champagne style. 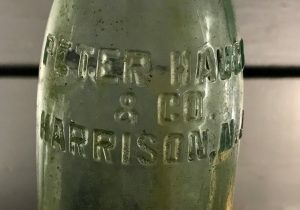 The company name “Peter Hauck & Co. Harrison N.J,” embossed on the bottle was utilized from 1885 to the early 1920’s. The bottle however is machine made so that puts it in the latter half of the period, say 1910 to 1922.